There are so many highs and lows associated with raising kids. Moms of singletons and multiples alike know that. This week, I had a low moment. A really low moment. I'd actually call it a mommy fail moment. Our kids just moved up to the Preschool class at church. The first Sunday, we just took them during the Sunday School hour. It was a little rough, but not horrible. This week, we took them for the entire morning. Oh wow. From what I understand, it couldn't have gone any worse. During the Worship Service, I got a text from the preschool room that they were in major meltdown mode. I immediately left the service and found Elijah in a completely inconsolable state. Elijah is the happiest of my kids, so it was so weird to find him so upset. It turns out, that he wanted to color and it wasn't his turn yet. *sigh* We have been working so hard at home on sitting quietly at the table and coloring. They are getting really good at it, and now really enjoy coloring time! The problem is that we always do everything as a group, and the preschool class has the kiddos divided up into three group that rotate through stations. My kids have no idea how to do that yet. And that was made very clear during church. So this is what ended up happening: All four of them didn't sit still for the Bible story, and Elijah was beside himself with how much he wanted to color. I ended up staying in there until Fellowship Time to try to help them learn that they need to stay with their group and listen to their teachers. Elijah pretty much howled until it was finally their turn at the coloring station. Happily, they did do better during Sunday School. It was more laid-back, and they managed to sit still for 15 minutes during the second Bible Story time. But I found out after we left church that they are considering moving them back down to the nursery. I'm honestly just beside myself. The reasoning is that my kids are distracting the other kids from the story time. I understand that, but whether they move up now or move up in a year, they are still going to have to adapt to their new surroundings. The other thought that they suggested was to split them up with two staying in the preschool class and two going back to the nursery. I do know that I'm not okay with that arrangement. We want our kids to stay together. So where one goes, they all go. And I desperately hope that they allow our kids to stay in preschool because a couple of them (especially Ellie) are more than ready for it! I knew that there would be a learning curve to a more structured class. I feel like that's to be expected with two-year-olds who have never experienced something like this before. Especially since we have a routine, and they know what to expect, changing it up on them is bound to cause a little confusion. My kids do really well when they know the routine and expectations that we have for them. I really feel like they just need a chance to adapt and learn the new routine. We want the best for them, and being in the preschool class is what we feel is the best arrangement and challenge at this point in their lives. There are 15 kids in the class, and about half of them are two years old. I want them to stay with other kids their age. We've been so delayed in everything else and have tried so hard to catch up, that being demoted back to the nursery feels like a huge step backward to us. 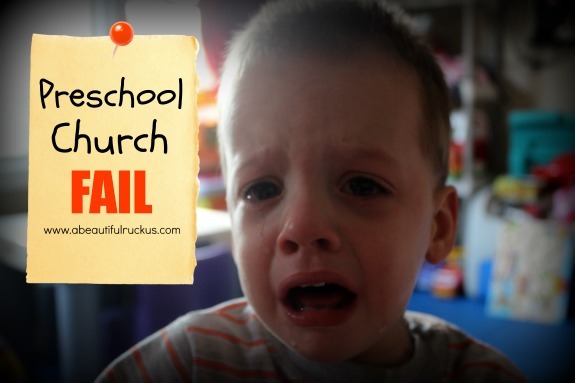 Can we at least move to church Preschool on time? I'm so frustrated with the never ending process of trying to get them caught up with other kids their age. We've been working on this non-stop since they were born, but I think part of the issue is that they don't "look" delayed. It's an invisible delay rather than a visible physical issue. Because of that, I think that sometimes people forget that it takes them just a little longer to adjust. At the same time, I don't want to be "that mom" that insists on her way. Especially if other kids aren't able to learn anything since my kids are being disruptive. But since they are two and still a little delayed, wouldn't it make sense to give them a little extra time to adapt? I feel like such a failure as a mom. The other two-year-olds weren't nearly as disruptive. Maybe this all comes back to me, and I'm just not doing something right. It's true. I cried. I don't want my family to be an inconvenience, but we do pose a unique situation, and there is nothing that I can do to change that. I've talked extensively with the kids' Occupational Therapist and the Assistant Children's Ministry Director about the most effective way to approach this. I've asked for some transition time, and have been given until October 6th for them to figure out the routine. They are also planning to make "sitting circles" for all of the kids in preschool so that they have a special place to sit. They very kindly offered to make duplicates for us so that we can practice sitting at home while reading books. Along with the Assistant Children's Ministry Director, Sean and I will also spend every Sunday in the preschool room with them to help them learn the new routine and expectations. I feel like I'm bordering on desperate for some sense of having normal toddlers and letting them experience the same things as other kids their age. I said that I would do anything to keep them in that class, so that's the plan of action at this point. We are grateful that they are working with us on what we feel is the best thing for our kids. We really do have a great church. Am I being overly dramatic? I know that sometimes I get too close to situations as a mom. What would you do in this situation? What is a fair amount of time to give them to adapt to the new routine? I want to be reasonable and considerate of the teachers and other kids too. As a retired teacher and a mom, I would put them where they are comfortable and give them maturing time without such unhappiness. I don't get why it is so important for you to have them "caught up" by age two--Let them develop where they are--they will be much happier children and right now you want their "school" experiences to be positive, fun and in a situation where they fit. I hope you will relax the box you want them to fit into and let them develop as they will. If the girls are able to fit into the two year old class, why not let them stay and let the other two have more time to adjust. It is, after all, only a couple of hours a week. I think you need to relax about this...I KNOW it is hard and you want the best for your kids. Run this by some seasoned moms and teachers and see what they say. I always think of the verse that says "there is wisdom in a multitude of counselors". My boys all started first grade as they turned 7 or would shortly after school started. The girls were six in first grade because of the difference in development. It worked out well and all are very productive adults. I will tell you this, that Isabelle remembered her Bible story pretty well, so they mustn't have been TOO distracting. (Although, she did tell my that Elijah was crying.) There are a LOT of kids in there this year, and I think that just ups the stress factor and chaos. Your kids have never really been in that sort of situation - it will take time. I hope they can get used to it and don't have to go back to the nursery. No, you are not being overly dramatic. Poor little Elijah. These children are only 2. 2 years old. I'm not sure how to suggest it lovingly and graciously but those running the preschool church room need a training on developmentally appropriate practices for this age group. STAT. Your kids are just fine. And no, I would not want them split up 2 and 2 either! You are not a bad Mum- sorry you've had a tough week. I am not a mum of multiples so feel free to disregard the next bit- why do they have to stay altogether? If the preschool room is a good match for some of the quads and the nursery a better match for others then let them be where their needs are best met. From the outside looking in it seems you're still distressed about their early start to life (completely under stable), I'd just encourage you to step back and look at each child and where they are at individually not as a cohort of four. I agree with Portland Granny, relax and accept that kids mature and develop at different speeds. I think you should let the ones who are ready for the change go for it and let the others stay in preschool a bit longer. They need to enjoy Sunday School and church time!!! Agree with above comment...whether you have multiples or a single, moms are constantly trying to make their kids "fit in". But why? My son didn't start talking as "soon" as his classmates. We freaked out and sought possible therapy . The therapist said there was no delay and just to relax. Sure enough, within a couple weeks he was a chatter box. Also, I think you are being unfair to insist that they all stick together. If some are ready and others arr not, how is that fair to hold them back. Its very likely that when they go into a formal school setting the school will separate them. You need to start preparing yourself for that and that they do not always have to do everything together. I was told once by a very wise person that you should never hold back a child who is ready to soar just because the others are not. Not only is it not fair to that child it is not fair to the others. After my one child moved up I could see this was the right thing to do even though I couldn't see it at the time. Well, as an early childhood educator I'd recommend rethinking splitting them up. It wouldn't mean that some of your kids are better than others, just that your considering what's best for each individual child. I assume that your goals for church preschool are learning the content, learning to play with other kids, and learning school behaviors. They are much more likely to be successful if they're in a developmentally appropriate setting. HOWEVER. I totally understand wanting to keep them together, especially since church is a family thing. In that case I'd recommend trying library story times for practice listening to stories and other adults. Kids tend to catch up and assimilate very well during the elementary years. I entered kindergarten a year later because my parents believed I wasn't ready for the structure quite yet and I turned out alright (at least I like to think so)! Ultimately, you have to work with where the kids are at. I think trying different things lets you know how close they are but don't be afraid to recognize it's not working. I think trying to mimic the same class environment at home might also be a good thing to do. So if Elijah has issues with waiting while he sees others color that would be a real scenario to work on at home. Just some thoughts! Oh no, don't think it's you! No, no, no! Sometimes kids are just different and that brings unique challenges. My kiddo was "off the charts" on height and tested 2 years ahead academically, which meant no one understood his social delays and behavior issues. They thought he was older, thought he was smart enough to figure it out, thought he was being intentionally disruptive, thought I wasn't tough enough on him, none of which is true. When kids are a little different, the world has a hard time with them. But it sounds like your church is blessing and will work with you. That, in my experience, is the single most valuable thing, someone who will WORK with you, not judge, not push them out, not talk down to you. And you being a part of it is great. I've had to do a lot of that too :) Also practicing at home. He's nearly 8 and we still do that with certain things. Completely normal!! Many moms go through this. I had the hardest time and cried because I was so sad my little ones were struggling with Sunday school. You can not give up. Each week it will get a little bit better. And soon they will love it so much! Also I personally would re consider splitting them up. That is not a bad thing in my opinion. They need to learn the skills of being able to listen and learn and make friends on their own. Having them all together I am sure is a security blanket for them but they have to learn to be independent. My two girls always wanted to be together non stop but it was when we separated them for some activities that they really blossomed. You are doing a great job and you are a amazing mom. If 2 are ready you should let them go. They are individuals. As they get older they are going to excel in different things. If you had one naturally good soccer player would you make him/her stay on a developmental team just because that's where his/her siblings were at? Let the ones who are ready move up and enjoy themselves and move the other ones back where they are comfortable and keep working with them at home. No sense in stressing them out. A: They are 2. MOST 2 year olds have a really hard transition from the nursery up to the 2's class. It's totally normal, and most kids it takes them weeks if not months to assimilate. B: I personally would keep them together because that is what they are used to and I think it would make their transition smoother. D: Most important - you're a great mom. You invest everything into your kiddos and they are leaps and bounds past where they could be at this point. You are helping them succeed every day!! Love you!! Try not to stress too much about it. My son had a lot of delays and is now mostly "caught up" and I used to think he would never fit in with his age group and become all mama best on people who I thought were treating him different lol well now he's 4 and sits still and attends during group time. Now my two year old on the other hand would never be able to sit for 15 mins much less 2 mins without throwing a fit. Ask yourself, will it matter in a year you had to put them back in nursery for a few more months until moving them up? Probably not...and in 10 years you will be laughing about your kids acting like monkeys and getting "kicked out" of church preschool! Good luck! Um, your church has unrealistic expectations first of all as to how a two year old can behave. Second off, I think you should rethink splitting them up. If one child is ahead developmentally of another child, it isn't fair or beneficial to either child to try to keep them together just for the sake of keeping them together. If one of your children turns out to be academically gifted and the other is average, I highly doubt you would try to keep them together just to do so. If Ellie seems like she is ready to move up, move her up. If Elijah needs to stay behind, let him stay behind. Children develop and mature at different rates, and girls are notorious for developing faster than boys. Did your OT suggest using a visual schedule? That would let the kids know what is coming next and also see that they will get a chance to do their favorite thing such as color. You could even use it at home when you are practicing, particularly if you practice stations. Start with a small amount of time at each station and increase gradually. I have 3 year old twins and an 18 month old. I totally get what you are going through. My 3 year old son cried when I left him at church from 9 months old until just in the past few months. It is hard. It is so hard and honestly stressed me so much that I ended up having anxiety about going to church. The best thing we did was just stick it out and try to work through it. It sounds like you and the church are both giving a little bit and trying to make this work. I really hope it works for you, but don't for a minute think you've failed if it doesn't. Some kids have a hard time with separation and you are home with your kids all the time (so am I) and I think that makes it even harder for them. I also understand wanting to keep them together. That is one thing I struggle with so much. They have SUCH a strong bond and LOVE being together, but sometimes one might be ahead in a certain area. I don't know the answer to this issue because I am dealing with it myself. Hugs and keep us updated on how this goes. I pray that next week it's a piece of cake since they now know how the schedule goes at church! *hug* I've read through your comments here and I don't know that I have any new wisdom to add except that I don't think my two year olds would even be able to follow what was happening in a setting with so much structure! Rules and acceptable behaviors sure, but stations? Waiting in groups? 15 minute story times? No way! If they have to go back to nursery to PLAY when all is said and done, please don't feel like they are missing out! I think you are a very brave woman to post this story and invite diverse points of view. You've done this kind of thing before on your blog and I truly admire you for being so open and so welcoming of different opinions. THAT is what makes you a great role model and Mom. I don't have any kids yet, but I've worked in children's church for years (especially. You haven't failed with your kids. It sounds like your kids just need a little time to adjust. I wouldn't stress about it (kids can pick up when your stressed and can make them uneasy). Take one week at a time and go from there. Elijah could have just been having a bad day as well.